"You know the old saying about turning something negative into something positive? I have always had a passion for houses since I was a little girl. I would make my parents pull over to look at any house I thought was interesting or that "might be for sale". I love all kinds of architecture - old and new - and have always enjoyed remodeling and decorating homes. I am very much a perope person and I love working with clients helping them find just the right home, neighborhood and schools for their children. Having worked as a teacher and principal for many years, I feel that I have an advantage in educating clients on the best neighborhoods for the home they want for their families and the schools and programs they want for their children." Why should someone use a realtor when buying a home? "I had the opportunity to work with a wonderful couple relocating to Houston from Dallas with two teenage children. The family is very close and the parents wanted the children to feel that they were very much involved in the process because it was a hard move for them leaving their friends and school behind. To give the kids ownership and involvement in the process we wrote a very professional and legal addendum requiring their signatures, that stated that the children had the final approval on the River Oaks home they eventually bought." 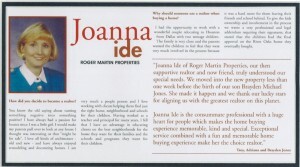 "Jo Anna Ide of Roger Martin Properties, our then supportive realtor and now friend, truly understood our special needs. We moved into the new property less than on week before the birth of our son Brayden Michael Jones. She made it happen and we thank our lucky stars for aligning us with the greatest realtor on this planet. "Jo Anna Ide is the consummate professional with a huge heart for people which makes the home buying experience memorabale, kind and special. Exceptional service combined with a fun and memorable home buying experience make her the choice realtor."